DMV.com was created to help simplify your life by providing you with all the vehicle related information and South Carolina DMV services you may need, in one place. Quickly find information and services regarding driving records, vehicle registration, drivers license renewal, license plate renewal, getting a learners permit, and finding a South Carolina Department of Motor Vehicles approved traffic school. The SC DMV requires drivers license renewal for state residents. Learn about SC DMV license renewal and other drivers license services. Ordering driving records online from the SC DMV is convenient. Submit an SC driving record request online for an easy ordering experience. The DMV requires car insurance for South Carolina drivers. Compare car insurance rates in SC, and get low cost car insurance today. Passing an SC traffic school course allows drivers to reduce points on their record. Learn about taking a defensive driving course in SC online. A South Carolina DMV practice test can help you pass the written test. Take an SC DMV practice exam online before taking the license exam. Discover SC car registration services provided by the DMV. New car registration in SC is required after buying a car or moving to the state. Completing South Carolina drivers ed is a DMV requirement for some first time drivers. Learn more about first time driving school in SC. A South Carolina auto bill of sale officially records a vehicle’s transfer in ownership. Learn how to get a bill of sale in SC from the DMV. Learn how to pay a ticket online in SC today. Unpaid South Carolina traffic tickets may lead to license suspension and reinstatement fees. Learn about South Carolina DUI laws and DMV driving privileges. SC DUI consequences include fines, license suspensions and other penalties. Buying a car online can expedite your South Carolina DMV car registration process. Buy a car in South Carolina the easy way today. Some DMV services in South Carolina may require drivers to make an appointment. Find DMV locations and hours in SC quickly and conveniently. 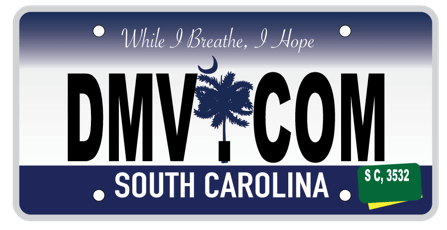 Let us present you the DMV.com – a website that will assist you in finding every information that you need about the South Carolina Division of Motor Vehicles. This is a privately owned site that has nothing to with any government agency and it is therefore an easy way to access information concerning South Carolina DMV without getting trapped in government bureaucracy. Here you will find all the requirements for all types of motor vehicles, starting from motorcycles up to boats.You will get yourself familiar with vehicle registration, obtaining and renewing a driver’s license, DUI information, credit reports and more. The search bar and the navigation sections will help you find exactly what you want. You can also find articles about the same topics for motorcycles and boats. We would like to encourage you contribute to this website by visiting our Facebook page, comment our articles and suggesting new topics. You are welcome to share your thoughts with us.